Take action and show your inner drive with the sporty styling of the men's Citizen AR watch, powered by light with Eco-Drive technology. Featuring a stainless steel case with midnight blue chroma finishing accents, midnight blue polyurethane strap and dark blue dial with date. 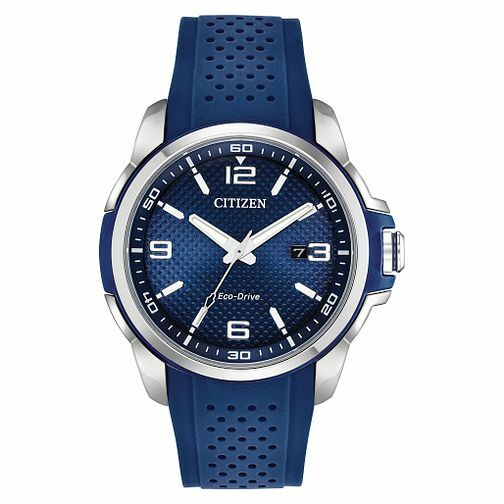 Citizen Eco-Drive Men's Blue Strap Sports Watch is rated 5.0 out of 5 by 3. Rated 5 out of 5 by Anonymous from Excellent Watch Easy to wear, easy to operate and see, so comfortable to wear, you don’t realise you have it on!